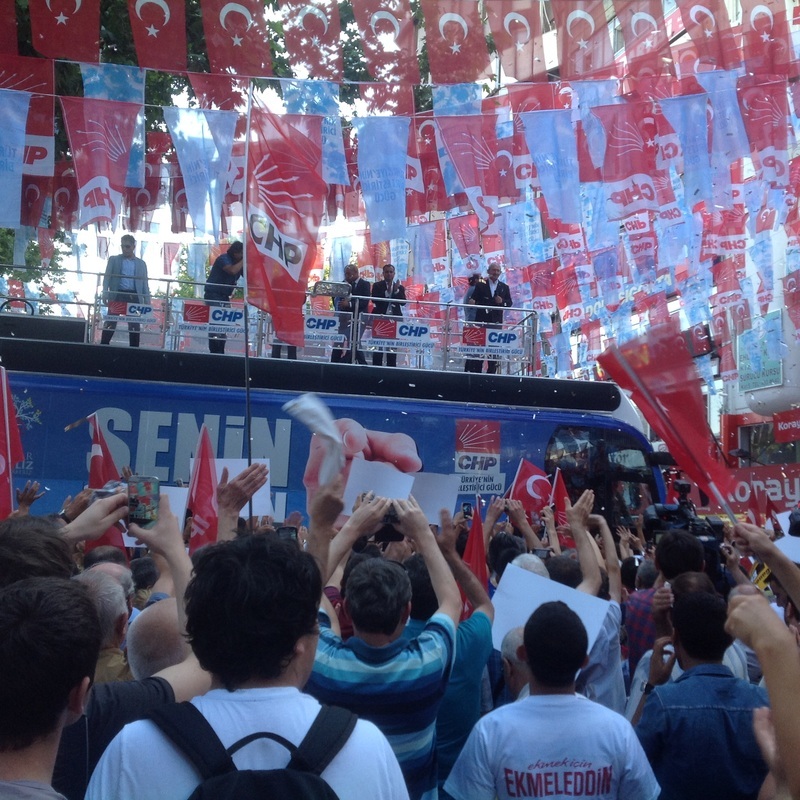 Kemal Kilicdaroglu (pictured upper-right), head of the main opposition Republican People's Party (CHP) urges supporters at a rally in Ankara to vote for Ekmeleddin Ihsanoglu (also supported by the Nationalist Action Party and other smaller parties) in the run-up to the country's first direct election of the president. 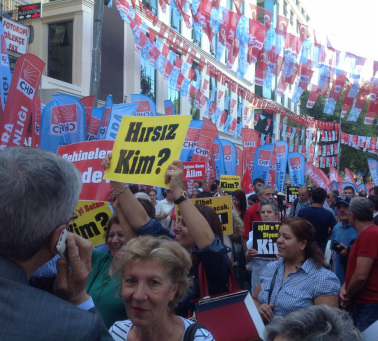 One of the signs carried at the CHP rally asks "Hirsiz Kim?/Who Is the Thief?" in reference to a massive corruption scandal that implicated many members of the AKP, including Erdogan's son. 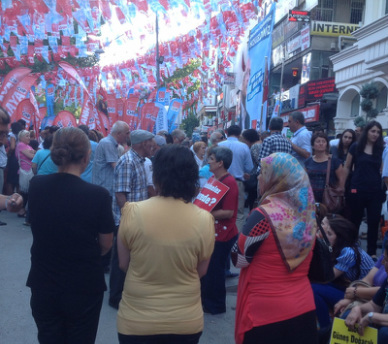 In terms of demographics, the majority of participants in the rally were middle-aged and above, and there were a few pious attendees among the traditionally secular CHP crowd. 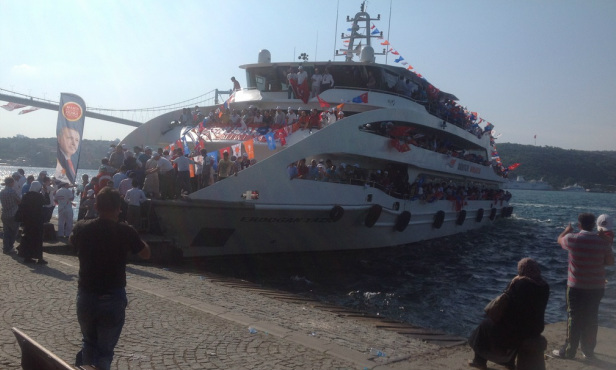 Supporters of the ruling Justice and Development Party (AKP) board a boat headed to a rally aimed at bolstering support for the government during the Gezi Protests. 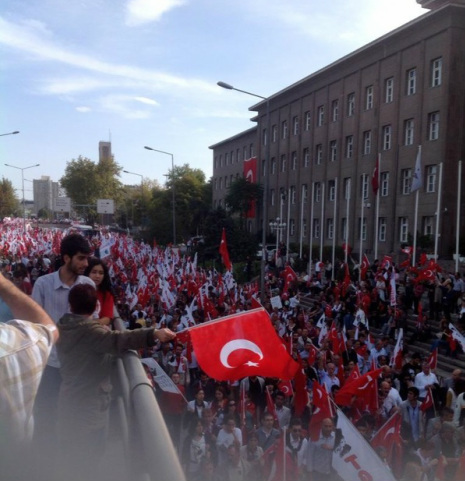 View from a bridge in Ankara on Republic Day (Oct. 29, 2012). After much protest, the municipality removed the barricade it had put in place to prevent people marching from the country's first parliament to the mausoleum of the Republic's founder, Mustafa Kemal Ataturk. 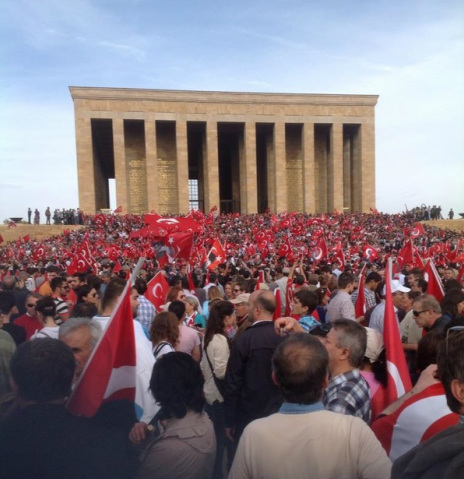 Thousands marched to Anitkabir, Ataturk's mausoleum, chanting slogans such as "Turkey is secular and will stay secular," "We are Mustafa Kemal's soldiers," and "Shoulder to shoulder against fascism."